My contractor will give me a free estimate. Why should I pay for an engineering inspection? Aren’t all engineering reports the same? How do I select an Engineer? Why are there differences in engineering inspection costs? I called several contractors and each one proposed a different repair plan. Why? My City requires an Engineering report before a contractor can pull a permit. Why is this report needed? My contractor says if I sign up with him he’ll throw in a free Engineering report. Why should I spend additional monies for my own Engineer? How do I know if I have structural problems? Why am I having foundation movement problems? Are trees contributing to my foundation problems? I’m confused by all the repair methods advertised. How do I determine which is right for me? How do I select a contractor? How do I know I can sell my home after doing foundation repair? I’ve heard foundation repairs aren’t permanent, so why not just wait until I sell my property and then make repairs? My foundation moves down during the summer but always comes back during the winter. Why do I need repairs? Why do I see cracking in brickwork and sheetrock, but not in my slab? I have brick cracking over my garage door. What’s going on? I’m building a new home. How can I be sure I have a good foundation? I see sagging in my roof. Do I have a structural problem? How does a plumbing leak affect my foundation? How do I know if I have a leak? I see water standing in my crawlspace. Is this a problem and what should I do about it? What is the difference between a French drain and surface drains? Which one should I use? I’ve been told to water my foundation and at the same time provide slopes to discharge water away from the building. Isn’t this contradictory? I live out in the “Boonies”. What geographical areas do you service? Some cities require an engineering report before the contractor can obtain a construction permit. Without an independent Engineer’s report, each contractor will likely propose a different repair, causing confusion in the selection process. Jensen Engineers can provide an independent perspective on any problems encountered. We will offer a cost-effective solution, utilizing the most appropriate method of repair. Aren’t all engineering reports the same? When evaluating Engineers, please keep in mind there are a variety of report types. A “Level A” report is limited in scope, does not measure elevations across the structure and is generally a poor value. A “Level B” inspection should be the minimum acceptable report type for purchasing a home or repairing a foundation. This report type will outline defects, measure differential elevations across the foundation and make recommendations for repair. Why are there differences in engineering inspection costs? As mentioned in Question #2, the scope of inspections can vary, requiring more time and work to perform. Typically, an entry level Engineer will price his services lower in order to attract business. You must decide how much experience and expertise you require based on the value of your property. Repair contractors employ estimators who are typically not Engineers, using titles such as “Certified Foundation Inspector” or “Foundation Specialist”. These qualifications are not the same as those of a Professional Engineer, so problem definition and solution can vary with individual education and experience. Typically, these estimators will only propose the type of repair the company regularly offers, irrespective of your situation. It is not uncommon to call out 5 contractors and receive 5 different repair proposals. Jensen Engineers can eliminate these problems. Many Cities in the Metropolis have adopted this program in recent years, attempting to eliminate the “rip-off” artists. These contractors would promise you a great deal if you signed up on the spot. In reality, they merely wanted to take your money by scaring you into a prompt decision, not necessarily addressing your particular problem. The only way to have an unbiased opinion of needed repairs is to hire your own Engineer. A “free” Engineer’s report is no different from a “free lunch”. This approach means the Engineer will likely work off the repairs proposed by the estimator, simply “rubber stamping” this proposal, perhaps without even visiting the property at all. How can this be in the best interests of the homeowner? If you experience differential foundation movement, you may see brick and drywall cracking, separations at corners, doors or windows, door misfits and sloping floors, to name a few signs. See Foundation Checklist. Continual movement over the years will result in progressively greater damage to the foundation and superstructure, lowering your property values. The only way to really know for sure is to have a qualified Professional Engineer inspect your structure. I’m confused by all the repair methods advertised. How do I determine which is right for me? One of the responsibilities of an Engineer is to specify a pier type appropriate to your property, best done after evaluating site-specific soils data. A contractor will only be able to propose the specific pier type his company offers. After you receive your Engineering report from Jensen Engineers, all you have to do is call several contractors, asking them to bid the work. The bids you receive should all match report specifications, minimizing your time and efforts in the selection process. After you visit with the contractor’s estimator comparing pricing, schedules, insurance, and experience you will likely be able to make your selection. If requested, we can offer names of contractors most able to perform the specific work. If you have foundation problems you may not be able to sell your property at all, so it is important to properly evaluate and repair the foundation. Realtors tell us a report from Jensen Engineers typically provides great comfort to prospective buyers, easing the transaction process. With minor exceptions, a properly-repaired foundation will usually provide a long-term solution if a proper analysis of the problem is initially made and all recommendations are followed. We recommend you seek advice from your realtor as to whether repairs should be done before or after a contract offer is made. A properly-repaired foundation can help bring top dollar when selling your property. A foundation can experience settlement during the dry summer months and lifting during wetter winter months. Typically, this lifting doesn’t match the amount of settlement, leaving elevations progressively lower with each cycle. Homeowners want to believe a settled foundation always comes back to initial positioning, but in reality, it doesn’t. The degree of slab cracking is related to the amount of deflection and quality of concrete. When a slab deflects, it is common for brickwork and sheetrock to exhibit the first signs of distress, although many times the slab has cracked microscopically, but isn’t readily visible to the naked eye. Even if you find no cracking of the slab, you may still have a foundation problem. Masonry in this application will typically crack when it deflects more than 0.3 in. at mid-span. This may indicate a problem with the steel lintel supporting this brickwork and/or the garage door header behind this area. Jensen Engineers is equipped to determine which of these items is deficient and design a repair procedure. The foundation should be designed by a Registered P. E., based on soil samples taken on your building site. Sometimes this data is extrapolated from neighboring sites, which can compromise this design. Watch out for excessive amounts of fill soil placed under the foundation. Ensure that your builder is following the exact specifications provided on the foundation engineering plan. A sagging roof may indeed signify a problem. Sometimes a wood shingle roof is poorly-framed. After new decking and a heavier roof are installed, these deficiencies are exposed by a deflected roof surface. During the repair process, roofing contractors sometimes cause problems by damaging braces within the attic area. 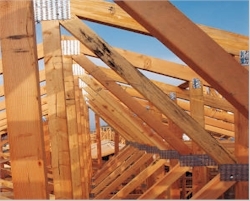 Jensen Engineers can design a repair procedure to re-support the roof. You may have plumbing leakage and not even know it. The introduction of excess moisture can cause volumetric expansion in supporting soils, heaving the slab. After the leak is repaired, some reversal of this heaving can occur, although complete reversal is not always possible. A qualified plumber can test for leakage in water supply and sewer systems. Crawlspace moisture can lead to invasion of insects, structural wood damage and can lead to air quality problems. Slight dampness is normal, but wet, muddy soils or standing water is unacceptable. Jensen Engineers has had extensive experience in designing moisture control systems. A French drain is designed to remove subsurface moisture, but can also be utilized in some surface water removal applications. A surface drain only removes surface water. Sometimes a contractor will install the wrong drain type, unknowingly causing foundation damage. It is important to know which type of drain is appropriate for your needs-Jensen Engineers can help make the proper selection. The goal here is to maintain consistent soil moisture content. Therefore, grades should be such that rainfall will continually flow away from the foundation, no matter how long and intense the storm might be. This minimizes the amount of moisture absorbed by soils under your foundation, limiting volumetric changes. When the climate turns drier, you can apply the correct amount of water to maintain consistent soil moisture content. We have performed inspections in Texas as far north as the Red River, extending eastward to Paris and Longview, as far south as Brownwood and west to Possum Kingdom Lake. Generally, geographical limits are defined by schedule availability and travel cost.